A cover line penned some 9,000 miles away. It’s hard to imagine a New York-based fashion magazine going for its January 2017 issue with the cover line “2017: Why It’s the Best Time to be Alive.” In fact, several well-known designers have already declared, perhaps foolishly, that they will not be creating any garments for First Lady-elect Melania Trump. But fear not. The image at right is taken from the cover of Vogue Australia’s January issue, hitting newsstands Dec. 19. It’s easier to be optimistic about 2017 from a vantage point 9,000+ miles away. 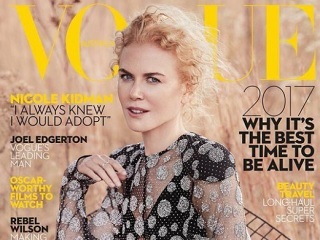 Donald Trump and Mike Pence won convincingly in Tennessee, where cover girl Nicole Kidman now spends a good part of her year with husband Keith Urban and their two children. She did the interview and Vogue Australia shoot in Nashville. While Kidman isn’t a huge fan of watching herself on screen, the Lion star revealed she did watch the movie with her sister Antonia Kidman. “It was fantastic, because she’s got six children,” says Nicole. For what it’s worth, readers of The Fashion Spot are less than impressed with the look of the January 2017 Kidman cover.